Travelers visiting foreign places know the importance of speaking the local language. Knowing the meaning of website terminology is key to understanding website performance. Several terms are used when gauging website performance. Some of the most frequently utilized terms are: hits, unique visitors, and page views. While these terms are used to describe website traffic, few people understand their true meaning and how it relates to website performance. A unique visitor is defined as one person accessing a website for a continuous period of time or session. No consideration is given to the time spent or pages viewed. Because counting ‘unique visitors’ is similar to counting attendance at a public event, it is often one of the best indicators of website performance. A page view is defined as a visitor accessing individual pages within a website. A page view is generated each time a visitor accesses a different page during a session. Page view statistics enable a webmaster to gauge which pages within a website are most popular among visitors. Hits are defined as a page view multiplied by the number of server file requests on each page visited. Because individual web pages often have dozens of calls to graphic and other files, ‘hits’ is a very misleading statistic. Although ‘hits’ is a poor indicator of website performance, it is one of the most frequently cited statistics for website performance. With a proper understanding of website terminology, one can better interpret website statistics and how they relate to a site’s performance. This information is key to gauging the performance of one’s own website as well as those you advertise with. Since 2002 irinfo.org has been the definitive internet resource for infrared thermography. Known for accurate, cutting-edge content, we maintain a readership of thousands of thermographers worldwide. Everyday, purchasers of infrared equipment and services begin their search for new equipment and thermographers on our website. Learn how we can help to increase your sales by calling us at 609-239-4788 or visiting us online at: https://www.irinfo.org/advertise.html. Loss prevention is a top priority for high level managers because fire or smoke can damage critical or sensitive utilities such as electricity substation or network switches. Under the right conditions, an infrared imager can be utilized to detect fire in its earliest stages. While fire and smoke may cause moderate property damage, they often create huge business interruptions which can compromise a company’s reputation. In some facilities, extremely sensitive air sampling systems are installed in critical utility areas in addition to traditional fire and smoke detectors. These sensitive air sampling systems can detect fire in its formative stages before smoke become visible. Historically, response personnel have spent considerable time to locate the origin of smoke after an alarm has sounded. For instance, a main electric substation can contain dozens of switchgear enclosures. In such areas, identifying a fault by sight or smell can require substantial time. According to the US FCC, the majority fire damage to electronic equipment is due to smoke. Smoke generated from printed circuit board components is highly corrosive. Even small amounts of smoke can have adverse long-term effects on electronics. In order to prevent a fire, time is of the essence in locating critical hot spots. 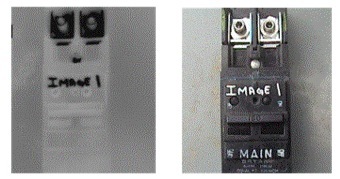 If not detected in time, electrical hot spots may ignite nearby flammable materials. Once a fire begin within an enclosure, it can double in size every 30 seconds. Once an alarm sounds, a trained operator can use a thermal imager to quickly perform a hot spot search to help prevent a fire. Hence, a thermal camera is a worth investment to prevent serious fire damage at the incipient hot spot stage within critical utilities. The recent introduction of 640 x 480 pixel imagers has many thermographers speculating on the impact this equipment will have on our industry and their business. In this Tip we separate marketing hype from physics by revisiting the issue of resolution and its importance in thermal imaging. Resolution is one of the most important objective specifications for a thermal imaging system. Due to a lack of standardization, this term is used in a variety of ways, many of which can be confusing or misleading. 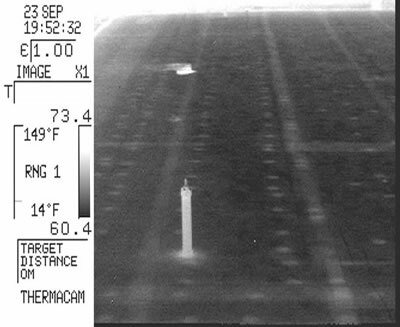 Simply stated, resolution describes the capability of a thermal imager to clearly depict a target. Imager resolution is not solely dependent upon pixel count. Rather, it is determined by an interdependent set of circumstances, the most important of which are described below. Detector: Many manufacturers offer total pixel count of the detector as a measure of resolution. Resolution generally increases with the number of pixels; however, pixel viewing angle (IFOV) also affects detector resolution. Meaningful IFOV data are frequently unavailable. Optics: Lens quality affects an imager’s ability to clearly resolve a target at a given distance. With no industry standard for optics, lenses can vary widely between imagers. Signal-to-noise ratio: Generally, higher ratios equate to increased image resolution. Imagers with poor ratios will provide imagery that is grainy, thereby compromising image quality. Display Monitor: To maximize resolution, the pixel count of an imager display monitor should equal or exceed the number of detector pixels. Compact or monocular displays can severely limit resolution. Use of a high resolution monitor cannot compensate for low detector resolution. When considering an imager for purchase, do not rely on pixel count as an accurate representation of imager resolution. Always try the imager under the same circumstances that you will encounter in the future. Because there is no objective method to determine imager resolution, one should physically compare subject imagers to each other and choose the one that meets their needs and budget. Don’t be surprised if the courts divert your next lawsuit to mediation or to non-binding arbitration. Since the trend toward alternative dispute resolution cuts costs for the court as well as for the parties, it shows no sign of slowing. In this Tip, we discuss the difference between mediation and arbitration. Court-ordered arbitration is a private and informal adjudicatory process similar to a court trial. An impartial attorney appointed by the court listens to presentations made by the disputants, and then issues a decision that (hopefully) settles the conflict. In some court-ordered arbitrations, the award of the arbitrator is legally binding and enforceable upon the parties, unless one or the other petitions the court for trial de novo (which means as though the arbitration never happened) and pays the required fee to do so. The arbitration hearing is much less formal in procedure than a court trial, but each party has the right to present proofs and arguments as in a court of law. Unlike mediation, in arbitration the parties give up the power to create their own solution, and place resolution of their problem in the hands of the arbitrator, but as a matter of practice, many cases settle once dialogue opens at the hearing. Mediation is an alternative form of dispute resolution in which a neutral third party tries to find a way for the parties to come to agreement of settlement. It is non-binding, and different from a trial or an arbitration because the goal is not a resolution ordered down in the form of an award by an arbitrator or judgment by a judge. There is no “decision” because there is no “contest” in mediation. Instead, the mediator tries to find a common ground and draw the parties toward an agreement. Mediation is often successful in cases where hard feelings over nonpayment act as a roadblock to dialogue, or where the amount of a claim of offset is open to reasonable debate (such as where the appropriate fix for a problem must be chosen from competing approaches). If no agreement is reached, the case goes back on the track to trial. Experienced electricians with a sense of humor will tell you, “It’s because they don’t know the words.” Recently, Swiss scientists have developed a more scientific theory on the reason for the hum associated with energized AC transformers. When alternating current reverses 60 times per second, the iron core of an energized transformer undergoes magnetetostriction twice during each cycle. In other words, 120 times per second induced fields cause the core to stretch slightly; a meter-sized transformer might stretch or shrink by only a micron but this would be enough to set up an audible 120-Hz hum. The new experimental work probes theories, going all the way back to Werner Heisenberg in the 1920s, about how the shrinkage arises from the magnetic interactions (spin exchange) among pairs of atoms (dimers), which share a common electron. The two magnetic ions want to be closer together. For studying this effect iron itself is not the best test material and the Swiss scientists (ETH Lab in Zurich and the University of Bern) use another magnetic atom, manganese. Mn is a common ingredient in the magneto-resistance data storage systems found in most disk drives. Normally in a pure crystal, Mn atoms would be arrayed in endless straight lines. But in this experiment the Mn atoms are isolated, two by two, with plenty of intervening magnesium atoms. This allows the researchers to variably “dilute” the magnet interactions between Mn atoms. The strength of these interactions (or to be more precise the energy levels of the excited Mn atoms) is measured by scattering a beam of neutrons from the sample, a process called neutron spectroscopy. The observed microscopic magnetostriction mimics the striction at the macroscopic level, but it does depart considerably from the predictions of the traditional Heisenberg model. Tip excerpted from American Institute of Physics bulletin, Physics News Update. Creating an appealing, functional, and effective website is much harder than it looks. It’s not simply a matter of taking a company brochure or catalog, converting the text to HTML, and throwing in a few pictures. A website is a 24-hour a day advertisement for your company and should be treated as such. You wouldn’t turn over the design of your next direct mail piece, newspaper ad, or TV commercial to an amateur, and the same should hold true for your website. Actually, more care should be given to your website considering the potential number of online viewers is much greater than the audience for any other communication medium. A website should not be static; it should be dynamic, offering the possibility of interacting with others in a way that traditional media can’t. As websites become more sophisticated, so does the need for experienced developers. Web designers also need to be familiar with the peculiarities of this new medium. Your website will be viewed by different people from all over the world using vastly different equipment. How do you design a page that needs to fit onto several different size monitor screens, set at a number of different resolutions, using a variety of different browser software? The best choice is to hire a professional web developer who will discuss available options and work with you to find the best solution for your business. Above all, resist the temptation to design your own website! Tip provided by WebSolutions Technology, Inc.
Thermographers who inspect large structures or elevated components often utilize aerial lifts or platforms to gain line-of-sight access to the inspected object. This week’s Tip focuses on safe work practices for this unique job challenge. Aerial lifts include boom-supported aerial platforms, such as cherry pickers or bucket trucks. The major causes of fatalities are falls, electrocutions, and collapses or tip over. Lastly, never exceed the load limits of lift equipment. Be certain to allow for the combined weight of the worker, tools, and materials. For more information on workplace safety standards and fall protection, visit www.osha.gov. When it comes to equipment calibration, thermographers often send their infrared instruments to the manufacturer at periodic intervals. To help ensure accuracy, thermographers should understand calibration procedures and review calibration documentation whenever possible. Within the thermographic community it is common practice to periodically return infrared equipment to the manufacturer. Typical time frames range from 12 to 24 months depending upon one’s circumstances. As part of the calibration process, most manufacturers will provide a statement of calibration upon returning the subject instruments. Recently, we sent two identical contact radiometers to their manufacturer for calibration. Both units had been providing inaccurate temperatures and were expected to need adjustment. The units were returned approximately two weeks later each with a calibration statement and the observation that neither needed adjustment. In reviewing the accuracy statement for each of the radiometers, it was noted that the tolerances were not in accordance with the manufacturer’s published specifications. When asked about the discrepancy, the manufacturer stated the calibration forms that we received were outdated and had been used by mistake. The manufacturer apologized and faxed the correct formula. Upon applying the correct formula to the calibration data, it was noted that the subject radiometers were out of tolerance for several temperature points. As a result, both radiometers were sent back to the manufacturer for proper calibration and adjustment. The above experience underscores the need for thermographers to understand manufacturers’ calibration procedures and the resulting data. Had we blindly relied on the manufacturer’s initial calibration, it is likely that we would have introduced significant error into our measurements. To help ensure equipment accuracy, it is always advisable to perform an in-house check of radiometric equipment on a regular basis, after manufacturer adjustments, or whenever equipment has experienced any physical shock. The Infraspection Institute Level II Certified Infrared Thermographer® training course teaches a simple method that may be used to check the calibration of infrared equipment. 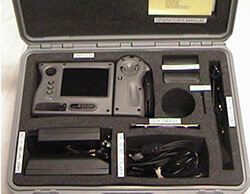 For more information on thermographer training or certification, visit us online at: www.infraspection.com. “First impressions count.” This timeless observation underscores the importance of appearances when meeting someone for the first time. This same observation also holds true in the modern, wired world. Experienced businesspeople know the importance of first impressions. To this end, they do their best to dress, act, and speak appropriately when meeting prospects. Why is it then that so many fail to understand that first impressions on the web are equally important? The worldwide web and email have greatly expanded the reach of many businesses. No longer are businesses confined to geographic regions; their ability to reach a worldwide audience is limited only by the connectivity of their prospects. The internet crosses international and cultural boundaries. Depending on local customs, people do things differently. This does not make them wrong. Remember, with every new encounter, others form impressions of you. Because first impressions can be permanent, make certain that your web impressions are always positive. Infraspection Institute has been providing infrared training and certification for infrared thermographers since 1980. Our Level I, II, and III Certified Infrared Thermographer® training courses meet the training requirements for NDT personnel in accordance with the ASNT document, SNT-TC-1A. All courses are taught by practicing, expert Level III thermographers whose field experience is unsurpassed anywhere in the world. For more information call 609-239-4788 or visit us online at www.infraspection.com. The Infraspection Institute Guideline for Measuring and Compensating for Reflected Temperature, Emittance and Transmittance provides procedures for calculating window transmittance and target emittance, both of which are critical to accurate temperature measurement. To obtain a current copy of the Guideline, call 609-239-4788 or visit our secure online store https://www.infraspection.com/ and follow the link for ‘Infraspection Guidelines’. “My kingdom for a horse.” This well known Shakespeare quote underscores the need for having the right tool when needed. In this Tip we offer a suggestion for helping to ensure that critical imager components are always available when you need them. Keeping track of thermal imager accessories can be a challenge. Modern thermal imaging systems are often supplied with a variety of accessories and attachments that can easily be misplaced or lost. In some cases, not having the correct accessory at hand can result in the postponement or cancellation of an inspection. Fortunately, there is a simple solution. Infraspection Institute has been providing infrared training and certification for infrared thermographers since 1980. Our Level I, II, and III Certified Infrared Thermographer® training courses meet the training requirements for NDT personnel in accordance with the ASNT document, SNT-TC-1A. All courses are taught by practicing, expert Level III thermographers whose field experience is unmatched. For more information call 609-239-4788 or visit us online at www.infraspection.com. Emittance is a number between 0 and 1 that numerically expresses how well an object radiates infrared energy when compared to a blackbody at the same wavelength and temperature. The emittance of an object will vary with temperature, shape and surface condition. In thermography, emittance can be further influenced by viewing angle and the spectral response of the imager/radiometer utilized. For nearly 30 years, Infraspection Institute’s Certified Infrared Thermographer® training courses have set the industry standard for excellence. Our Certified Infrared Thermographer® and applications courses combine infrared theory with practical real world approaches that enable students to quickly master skill sets that help to ensure accuracy. All courses are taught by field-experienced Level III practicing thermographers. For more information or to register for a class, call 609-239-4788 or visit us online at www.infraspection.com. Air travel is a job requirement for many thermographers. In this Tip, we offer suggestions for helping to reduce delays when passing trough airport security. Air travelers can greatly affect their experience at the airport security checkpoints by preparing in advance. This includes: packing liquids, gels and aerosols in checked baggage whenever possible, using 3-1-1 for carry-ons, arriving early and ensuring they are not traveling with prohibited items. For individuals who must carry liquids, gels and aerosols through the security checkpoint, it’s as easy as 3-1-1. All liquids, gels and aerosols must be placed in a 3 ounce or smaller container. These containers must be placed in a 1 quart, clear, plastic, zip-top bag. 1 bag per passenger placed in a plastic bin for screening. Pack smart. Bringing prohibited items to the airport will delay the screening process for you and other passengers. If you’re not sure which items are allowed, check TSA website for a complete list. Arrive on time. Arrival time recommendations vary by airline and day of travel, so check with your carrier. You must have a boarding pass and valid government photo ID to enter the security checkpoint. Remember to give yourself adequate time to check your baggage and move through security. Dress the part. Metal in your clothing may set off the walk-through metal detector. Pack coins, keys, jewelry, belt buckles and other metal items in your carry-on bag. Remember that all shoes must be removed and screened by TSA. Passengers also need to remove blazers, suit coats and bulky sweaters in addition to outer garments. Think. Belligerent behavior, inappropriate jokes and threats will not be tolerated. Such incidents will result in delays and possibly missing your flight. Level I Certified Infrared Thermographer® training course. For course schedules or to obtain a copy of the Guideline for Performing Infrared Inspections of Building Envelopes and Insulated Roofs, visit Infraspection Institute online or call us at 609-239-4788. For many thermographers, ladders provide a means for accessing remote areas and equipment. Taking the time to use ladders properly can help to prevent serious or fatal injuries. Avoid electrical hazards. Look for overhead power lines before handling a ladder. Inspect ladders before each use. Remove broken ladders from service and repair or discard. Do not exceed ladder load rating. Be aware of user’s weight including tools. Use a ladder only on a stable, level surface. Do not stack ladders on boxes, barrels, or unstable platforms to gain additional height. Maintain a 3 point contact with ladder (two feet, one hand). Always face the ladder when climbing and keep your body centered between the rails. Ladders should be free of slippery material on rungs, steps or feet. Never stand on the top step or rung of a ladder unless it is designed for this purpose. Lastly, permanent ladders should be checked prior to use to ensure that they are securely attached to their structure. Thermographer safety is one of the topics covered in all Infraspection Institute Certified Infrared Thermographer® training courses. For information on thermographer training and certification, visit us online at www.infraspection.com or call us at 609-239-4788. For many thermographers, ladders provide a means for accessing remote areas and equipment. In this week’s Tip we cover safety tips applicable to extension ladders. Inspect ladders before each use. Remove broken ladders from service and repair or discard. Use a ladder only on a stable, level surface. Do not stack ladders on boxes, barrels, or unstable platforms to gain additional height. Extension or straight ladders used to access an elevated surface must extend at least 3 feet above the point of support. Never stand on rungs above the point of support. The proper angle for setting up a ladder is to place its base one quarter of the working length of the ladder from the wall or other vertical surface. Be certain that all locks on an extension ladder are properly engaged. Do not exceed ladder load rating. Do not move or shift a ladder while a person or equipment is on the ladder. Lastly, a ladder placed in any location where it could be displaced by other work activities must be secured to prevent displacement or a barricade erected to keep traffic away from the ladder. Thermographer safety is one of the many topics covered in all Infraspection Institute Certified Infrared Thermographer® training courses. For information on thermographer training and certification, visit us online at www.infraspection.com or call us at 609-239-4788.